Home » Certified Products » Ask the Expert » Here Comes the Heat!! As we head into late spring, the temperatures begin to soar and we start scrambling to stay cool any way we can. In some homes, particularly older ones, room air conditioners are the most practical cooling choice due to their portability, low cost, and ease of installation. With roughly 8 million room ac units sold every year, it is important to make the right choice to save money and stay comfortable. ENERGY STAR certified models have been independently certified to meet strict energy efficiency specifications, which will save money on energy bills and help protect the environment. Click here for a list of ENERGY STAR certified room air conditioners. Buying a room air conditioner that is too big or too small for the space you’re cooling wastes money and will not cool properly. Figure out what size you need before you buy. Take the guesswork out of the process and use ENERGY STAR’s proper sizing tool. Some ENERGY STAR room air conditioners have advanced features such as connectivity (wi-fi controls), that provide additional savings and remote-control features. The advantage is that you can shut the units off when you are gone, saving money, but then pre-cool your room before coming back to the house, increasing comfort. Every year the ENERGY STAR selects one or more breakthrough technologies that earn the ENERGY STAR Emerging Technology Award. This year we are happy to announce that there are new room air conditioners that use new technology to dramatically reduce their energy use (and your power bills). Manufacturers are starting to take technology used in much larger and more expensive air conditioners, and transferring it to room air conditioners. 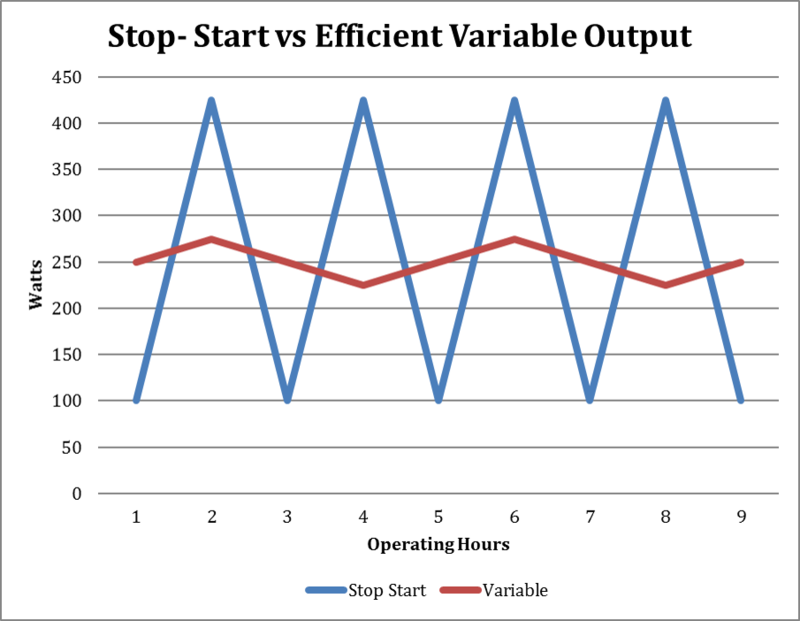 While typical units continuously cycle between stopping and starting, these new units use a technology called Efficient Variable Output, which allows them to operate more continuously, and efficiently, at a lower level (see figure below). The other advantage is that they are quieter and meet strict criteria for sound output. Typical room air conditioners operate like cars that go from 0 to 60 and back to 0, in a continuous on/off mode. Models that earn the ENERGY STAR Emerging Technology Award operate in a continuous, smooth and more efficient cycle, saving you on your power bills, and bringing quiet comfort to your rooms. Find qualified models here.